Images have the power to convey strong emotions where words fail. A recent review of popular websites has convinced me without doubt that images of human faces, used judiciously, can help conversion rates. Using the right images can also help a commercial website connect better with its target audience. On the flip side, bad stock images can create a poor impression and adversely affect the site’s traffic flow. A human face showing emotions can work wonders for a product or service! 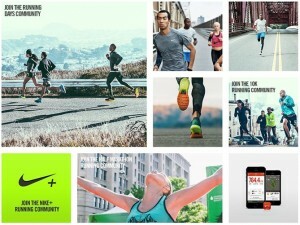 In Bringing Emotive Appeal to Your Website — What Does it Mean?, the author highlights the emotional appeal in Nike’s website images, which instantly convey a feeling of strength, physical endurance, and stamina—all related to a passion. While staring at the photo below, you will be inspired to run in a race. In Choosing Images for Your Website – The Minimalist Guide, the author uses the example of True Religion online store, which makes clever use of real human beings wearing their products to enhance consumer trust and comfort. The idea is to generate a consumer interest in the products. In one of Kissmetrics blog posts, 7 Tips to Boost Your Site’s Conversion Rates Using Images, the author talks about a very useful technique used by the Medalia Art website, where a human image instantly boosted the site’s conversion rates. During a test, the site’s photos of paintings were replaced by photos of the artistes, which sent the site’s conversion rate skyrocketing to a whopping 95%! Human faces alongside real testimonials add instant credibility to products and services that a website is trying to promote. Research states that stock photos can reduce credibility. If human faces are intended to create trust, then nothing works like photos of actual customers. 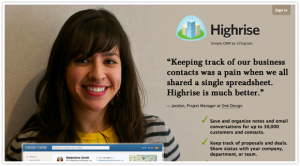 Example: In 13 Landing Page Tricks that Increase Conversion, the author talks about a proven trick of placing the photo of a smiling employee on the landing page to communicate a feeling of goodwill. To illustrate his point, the author uses the example of 37Signals, a CRM solution, which placed the photo of a smiling customer people on the landing page, and increased their conversion rates by 102.5%! 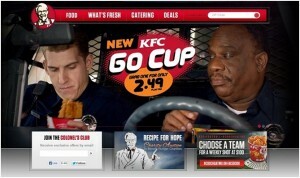 In Bringing Emotive Appeal to Your Website — What Does it Mean?, the author cites the example of a highly successful brand – KFC, to describe how a powerful image can immediately inspire the viewing audience to act. If you take one careful look at the picture below, which you must have seen many times before, you cannot miss the strong emotional connect. The picture instantly evokes a feeling of desire and temptation, inspired by the guy on the photo eyeing the Go Cup with such desire. The photo is bound to make your feel hungry and desperate to order a KFC meal without further delay.